I was in Conway, Arkansas recently to spend some time with my brother’s family and we had dinner at the MarketPlace Grill one evening. This is the featured dessert. I think they called it a Chocolate Mess, but I couldn’t find it on the menu so I’m not sure. I’m not sure how they do it, but they fill this parfait glass with good stuff, Joe & Josh had the peanut butter version, and then dip the whole thing in chocolate sauce, put it on the saucer and keep it all frozen. Or, maybe they dip the glass in chocolate and freeze it, and fill it with the requested flavors when the order is placed? Whatever. It was chocolatey, it was messy, and it was larrupin! There were a couple of things we could always count on when we arrived at Grandma’s house in Key West. There was a Key Lime Pie in the freezer, and the cookie jar was full. Grandma made Oatmeal Raisin Cookies for dad, and she put chocolate chips in them for us kids. I think the original recipe came off the back of one of those round oatmeal boxes. I have a scribbled copy under a magnet on my fridge. It’s on a 3 x 5 card with a couple of sticky notes with modifications I’ve made in different batches. Until today I always made them by hand, first combining the sugars with the shortening and then using a sturdy wooden spoon to work in the flour, oatmeal, chocolate chips and any nuts I added. Today, however, I used the fancy smancy second-hand Kitchen-Aid Mixmaster I got at an estate sale a couple of weeks ago. Paid $15 for it. A small ice cream scoop is just the ticket for making cookies all the same size. So here’s the scoop, so to speak. Mix shortening and sugars until creamy. Add egg, water and vanilla. Mix well. Dump in flour, salt, soda. Mix well. Add chopped nuts and chocolate chips or raisins as desired. Bake at 350° 8–10 minutes. Cool on a rack. Cookie dough goes on an ungreased cookie sheet. Another note says: “used molasses with brown sugar ~made a softer cookie~ 1 C almonds” As I recall I was nearly out of brown sugar so I added molasses to make one cup. Today I used cinnamon and nutmeg, 1/2 cup wheat germ, 1 cup crumbled slivered almonds, and 1/2 cup raw coconut. Cookies ready to come out of the oven. The cookies don’t spread much, and they don’t get very brown so keep an eye on the clock and pull them out within ten minutes. Leave them on the cookie sheet a few minutes. They’ll fall part if you try to move them while they’re still hot. Let the cookies rest before moving them off the cookie sheet. Sometimes you can push them back together and they’ll stick as they cool… or you can just eat the crumbs. Let cookies cool completely on a cooling rack. After the cookies cool completely put them in an airtight cookie jar. They’ll last several weeks unless you eat them first. You can sprinkle the crumbs on top of ice cream for a crunchy topping. This batch made exactly 4 dozen cookies. My birthday was Sunday, March 21, but a snowstorm blew all day Saturday so we decided to postpone the family gathering until the weather was more cooperative. I was delighted to spend the day by myself and made two of my favorite things: Spicy Talapia with Rice and Mango Salsa; and Key Lime Pie. I didn’t have as much red pepper as I would have liked for the mango salsa, and I was light on the lime juice because I used all my limes in the pie. But an extra splash of white vinegar gave it the tartness I crave and it was still delish. 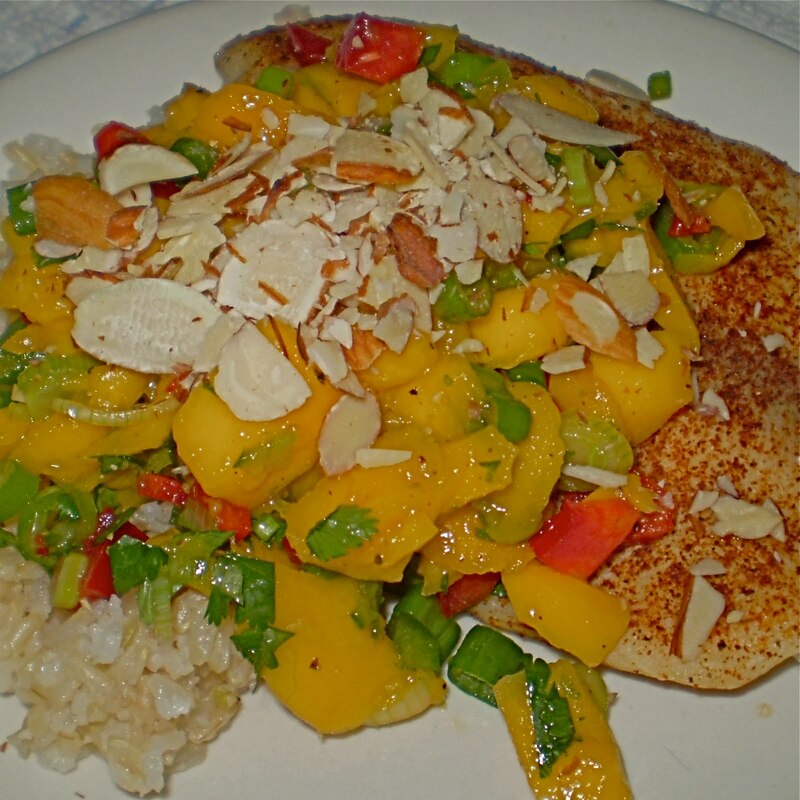 The leftover mango salsa is in the fridge mixed with the right amount of rice. I plan to have it with chicken breast this weekend. Mom promised me a German Chocolate Cake for my birthday, complete with coconut icing. But having just purchased a bag of key limes I decided I’d go with a Key Lime Pie on my birthday. My dad was from Florida, so all my childhood vacations were road trips to the Sunshine State. My grandmother lived in Key West and she always had fresh oatmeal chocolate chip cookies in a glass cookie jar on the kitchen counter when we pulled into the yard. And there was at least one key lime pie in the freezer. 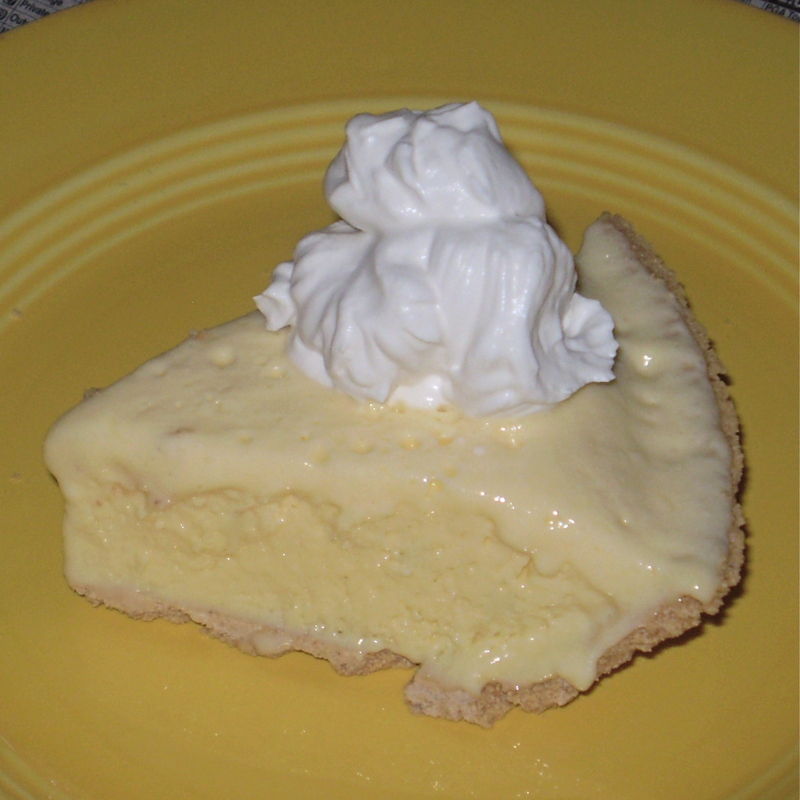 Real key lime pie isn’t green. It doesn’t look like pudding. And it isn’t baked. That’s the way my grandmother made it and I make it the same way. I know there is a risk of salmonella from eating raw eggs, but it’s a risk I’m willing to take a few times a year when I make one of these. I’ve also inlcuded my Aunt Dorthy Ann’s recipe without eggs. It’s also pretty darn good. Beat egg whites until stiff. Fold into other mixture. Pour into prepared graham cracker crust. Freeze. Serve with whipped cream on top. Pour into prepared crust and top with the other half of the Cool Whip on top. Freeze. For some reason, I had a store-bought graham cracker crust in the cabinet and I used it for this pie, but it was not as good as it would have been if I’d made my own. Make the crust ahead of time so it’s good to go when you’re ready to make the pie. Preheat oven to 350°. Combine all ingredients and blend well. Firmly press the cracker mixture over the bottom and sides of a 9-inch pie pan. To smooth it out, place a smaller pie plate on top and press firmly against the sides and bottom. Bake at 350° 6–9 minutes. Cool.